July | 2014 | cut it out, stitch it up! Kitschy Coo Lady Skater Dress – It Could Be The Best Dress EVER! After finishing the girl skater dress I was straight into making the Kitschy Cool Lady Skater for myself. When I finished the dress and put it on I was blown away. I wasn’t expecting it to look so good! The fit is fab and I love the drape of the skirt. 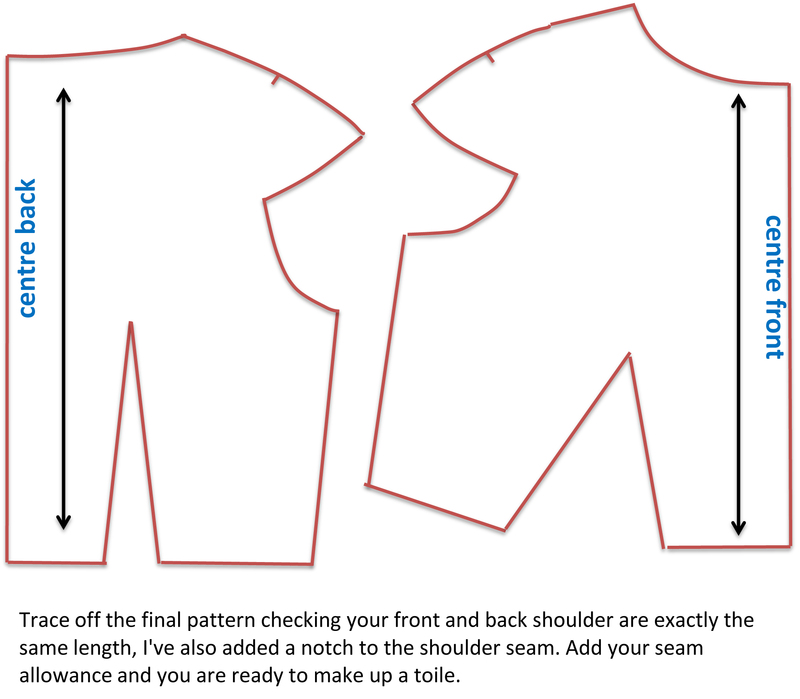 The pattern does suggest you make up a toile but I just wanted to get onto the real thing. The instructions direct you to measure your high bust and around and the waist. I was between size 2-3 for the high bust and 3 for the waist. So for the bodice I cut between the 2 & 3 at the armhole and shoulder then blended into the size 3 at the waist. 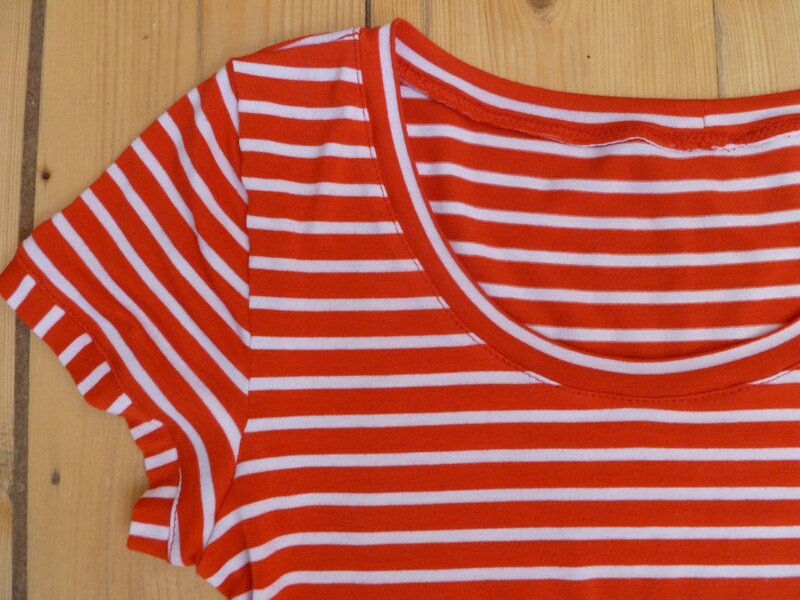 It took a while to cut out as I cut all pieces single layer carefully matching the stripes. After cutting the first piece for the skirt I used the cut piece as the pattern and lined up all the stripes so the front and back skirt would be identical. When it came to cutting out I can now see the advantages of using a rotary cutter with a self-healing mat I’ve never thought I had the need for them before. I weighted my pattern pieces with tins but to cut with scissors you are having to lift the fabric slightly which can stretch the fabric whereas with the cutter you would just leave it flat. Having a quick google the best price for an A1 self-healing mat is £17.83 from Graphics Direct. The prices can really vary and I suppose the quality does too. Rotary cutters seem to start from around £10. I don’t think I can justify the purchase this month but have a look again after the summer. But then the sewing got off to a very rocky start…. On my first shoulder seam I stitched the wrong side to the right side. It was easier to cut the seam allowance off rather than try to unpick the triple stretch stitch. (I ignored the fact that the sleeve would be affected). I trimmed down the front and back shoulders on both sides and needed to re-attach the clear elastic to the back shoulders. When I got to the end of the seam the loose end of the elastic got pushed down into the needle plate and I couldn’t turn the balance wheel to get the needle out. After a bit of struggling the needle came up and I had to take the bobbin out to release the fabric. And then there was a hole. 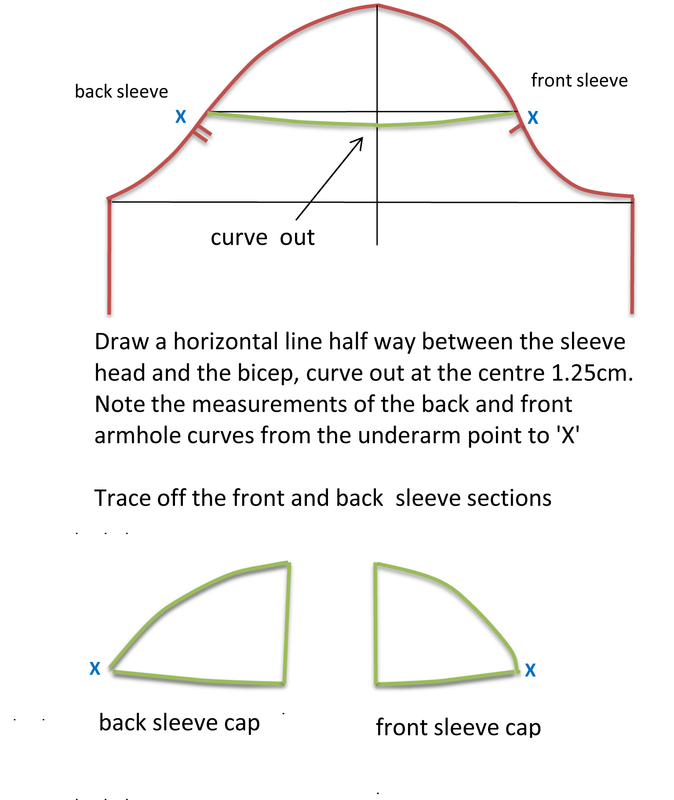 It was about 1cm in from the edge of the fabric, so I just trimmed the length of the shoulder slightly and re-shaped the armhole and did the same to the opposite side, no-one need ever know! 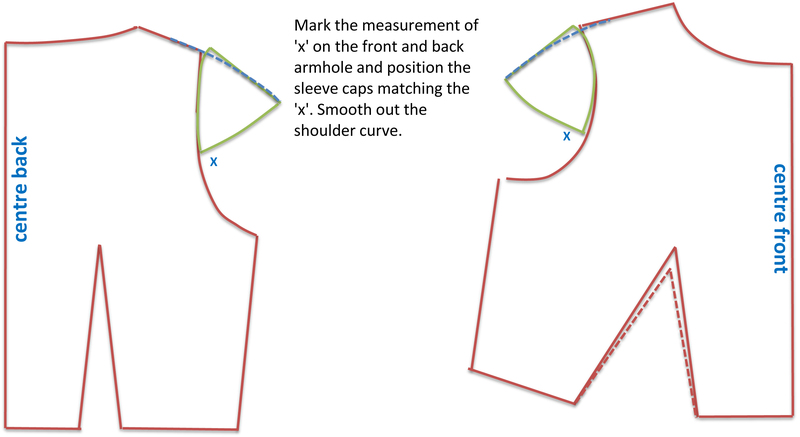 The instructions for the neck band have it attached with one shoulder open, I close both shoulders and sew on the round. The neck band on the girl skater was a reasonable success but this one was a pig. It took 2 hours from start to finish. To begin with I thought I’d be clever and use the stripes vertically. The fabric did have some stretch in this direction but of course not as much as horizontally. My usual -15% length for the band from the neck seam length was too short – or I just couldn’t get enough stretch out of the band. I tried twice then gave up. I didn’t want to cut it any longer as I didn’t think it would sit flat against my chest. So I cut it horizontally and it fitted fine, there was a bit of puckering which was sorted out with a steam iron. Despite taking a bit of the top of the shoulders the sleeves went in OK. When it came to sewing the underarms and side seams I wanted to make sure the stripes matched so I pinned and machine tacked using the longest straight stitch. 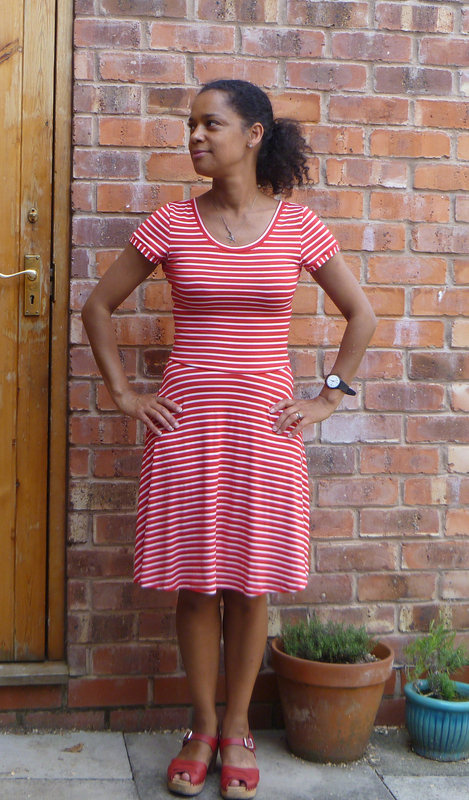 I had cut the sleeve bands with vertical stripes when I cut out the first neck band because you don’t need to stretch on so much they fitted fine. 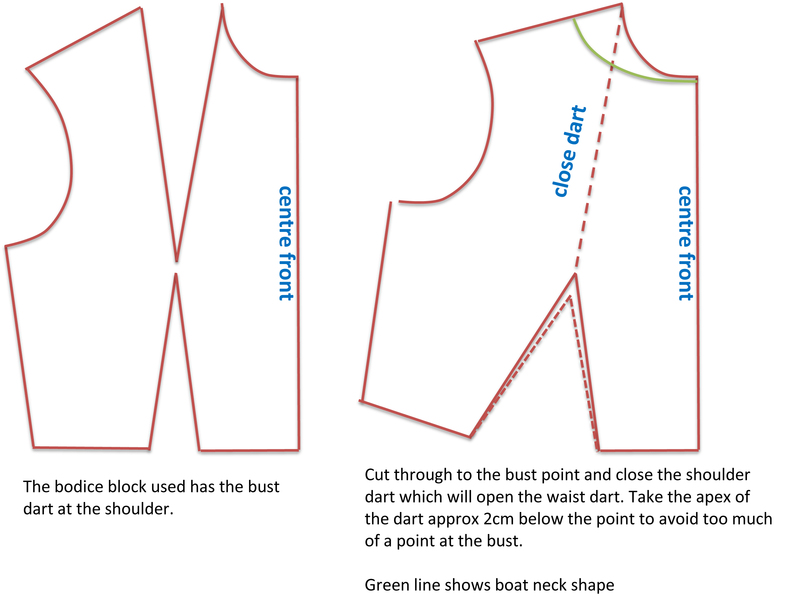 The pattern instructions suggest you attach before sewing the side seams but I chose to sew on the round. I started by sewing the hem with the twin needle but the tension wasn’t right and stitches were skipping. I played about with it for while but couldn’t get the stitching to look good enough. On the girl skater dress I got it to work OK, maybe the fabric being a bit thicker helped. So I gave up. I tried different stitches on scraps of fabric. A shallow zig zag just looked rubbish. Then I decided to work my way down the stretch stitches available on my machine and found one that worked and looked good. It wasn’t quite stitching as the picture but I was still happy with it. It wasn’t until I finished the hem I realised I hadn’t quite clicked the dial on to ‘S.S’ stretch stitch so the stitch was the ‘H’ on the left rather than the right. A good tip I picked up from the instructions was to use a zig zag stitch when attaching the clear elastic. This along with the Teflon foot made sewing it on straight forward. 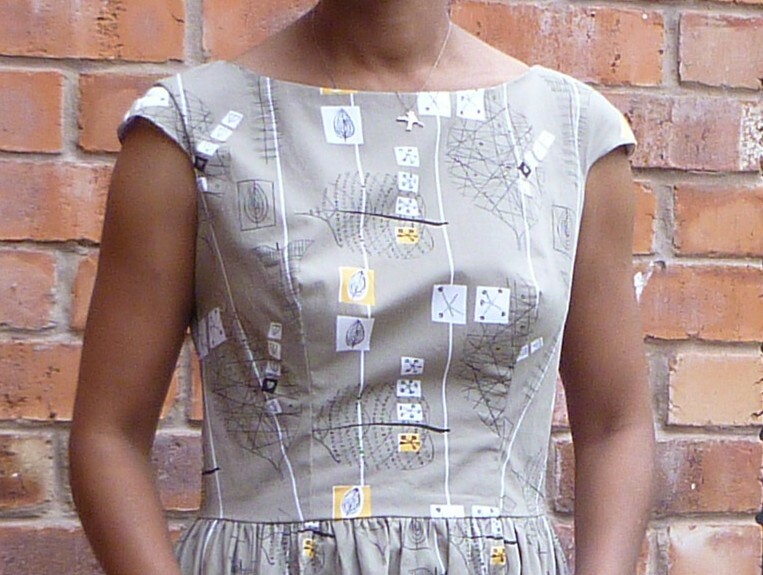 I had been apprehensive about stitching it to the front and back bodice waistline but there was no problems. I could have 3 thread overlocked the raw edges but again I couldn’t be bothered to get it out so I zig zagged and trimmed the seam allowances. So top priority is to get the overlocker fixed so it can be used as a 4 thread again. I called Bambers in Eccles to arrange to drop it in. There is currently a 4 week waiting period for machine repairs. He did give me some tips on cleaning the tension wheels which I’ll try but if that doesn’t work I’ll take it in at the weekend. When I told him it was a Singer he told me that some modern Singer machines just aren’t worth fixing but my 20+ year old 14U which was made in Japan is definitely worth it. The last time it was serviced the guy told me to keep hold of it as it was a good model. So hopefully by the beginning of September it will be up and running again. I wore the dress to work today and I got 6 compliments on it and me being me just said thanks and didn’t mention I’d made it myself – what’s wrong with me! Then when I was talking to a neighbour this evening who mentioned the dress my husband stepped in and said it for me! Anyone else use a rotary cutter and self healing mat? Do you think it is worth investing? This Kitschy Coo girl skater dress was cut out for Kids Clothes Week starting 9th April. It was never going to happen as I was away from the 8th for two weeks and it has been waiting to be sewn up since then. 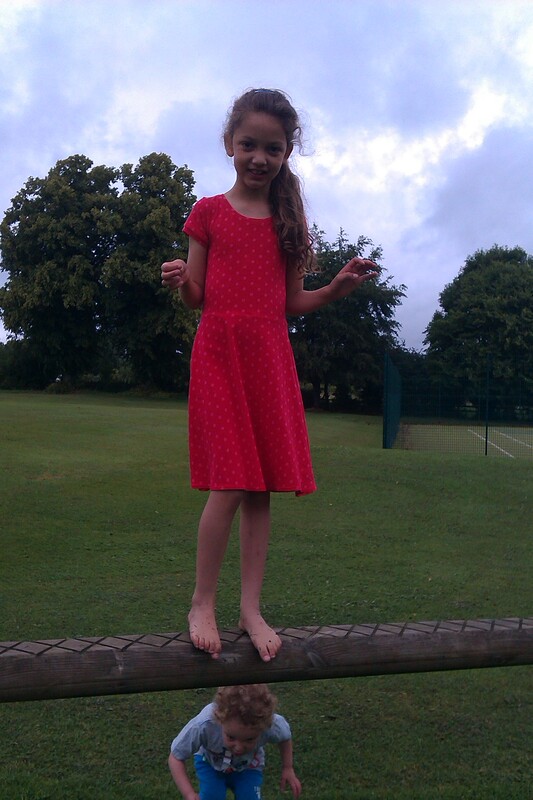 This is the second girl skater I have made, the first girl skater dress I made for KCW last October gets lots of wear. This time I chose the short sleeve version for summer. One change I made was to give the front neck a deeper scoop. 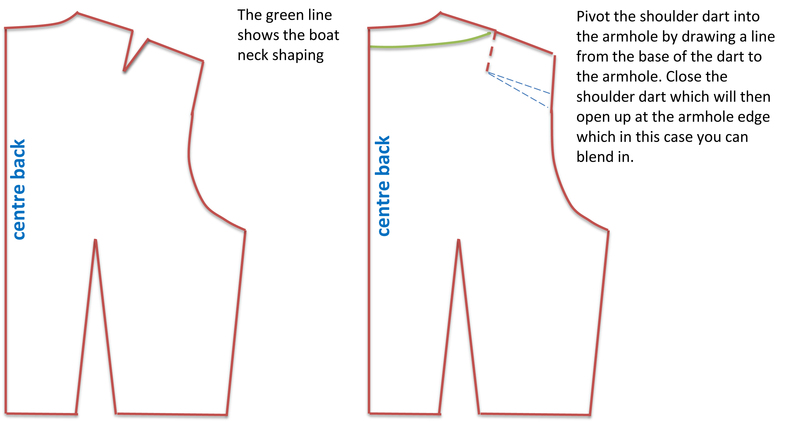 I also thought a lower neck would help with working out which was the front when putting it on – but it still gets put on back to front! I need to add a tag at the back. My daughter who is 6 ½ has only grown upwards in the last 8 months so I cut the same as last time, size 5-6 for the width and 7-8 for the length. I find the neck band the most challenging part of sewing knits but I’m getting better, I only had to unpick a small section of this one. I also machine tack it in first before sewing with the stretch stitch. For the neck band I didn’t use the pattern but followed -15% rule I picked up when I made my first tee from Maria of Denmark. Also I sew it on the round rather than leaving one shoulder open. I have also just bought a Teflon foot for my machine, amazon £3.55. I use clear elastic for stabilising the shoulder seams and have varying degrees of success when stitching it in. I found the Teflon foot did help and prevented drag and for what it cost was worth it. I finished the skirt hem with a twin needle. I’m finding this method a bit hit and miss. The finished hem is looking ok on this dress but I find getting the tension right is difficult. 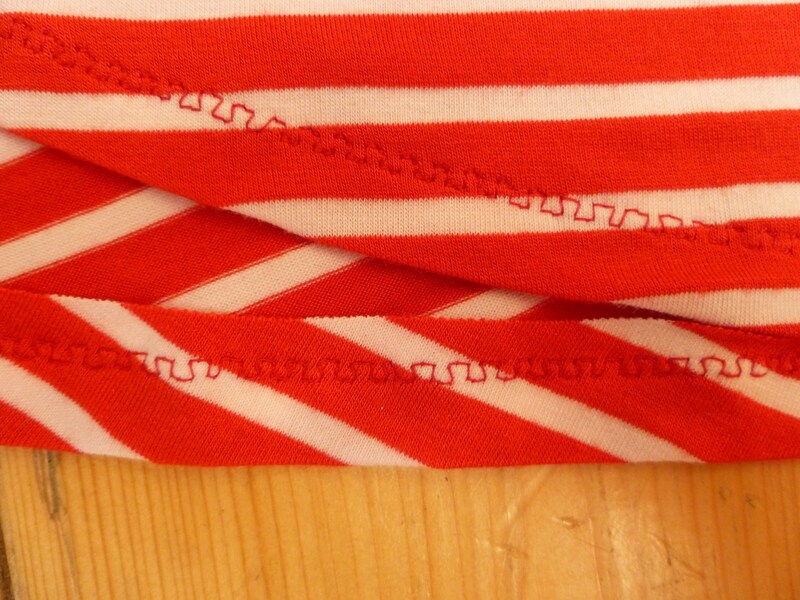 The seam allowances are finished with a zig-zag and trimmed. I was a bit lazy and didn’t get the overlocker out. 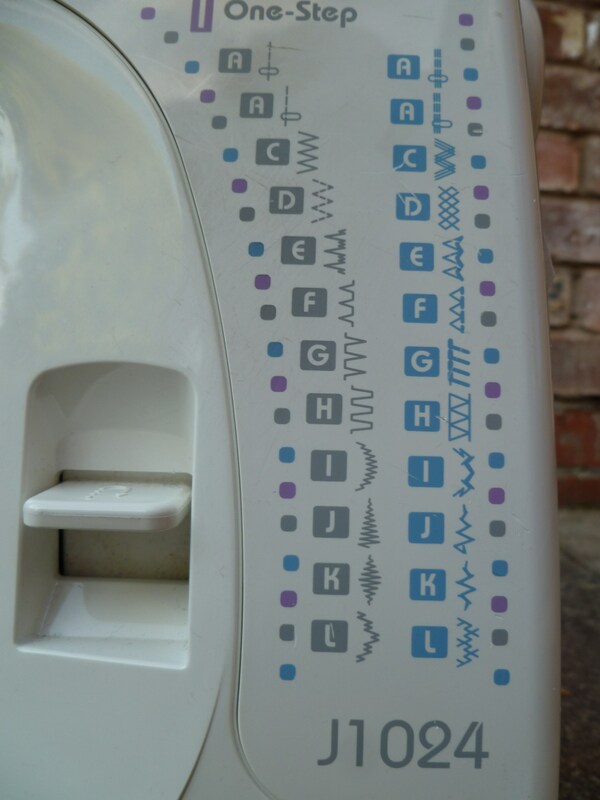 My machine is still only working as a 3 thread and I really need to get it fixed as it would make sewing up knitted garments so much quicker. 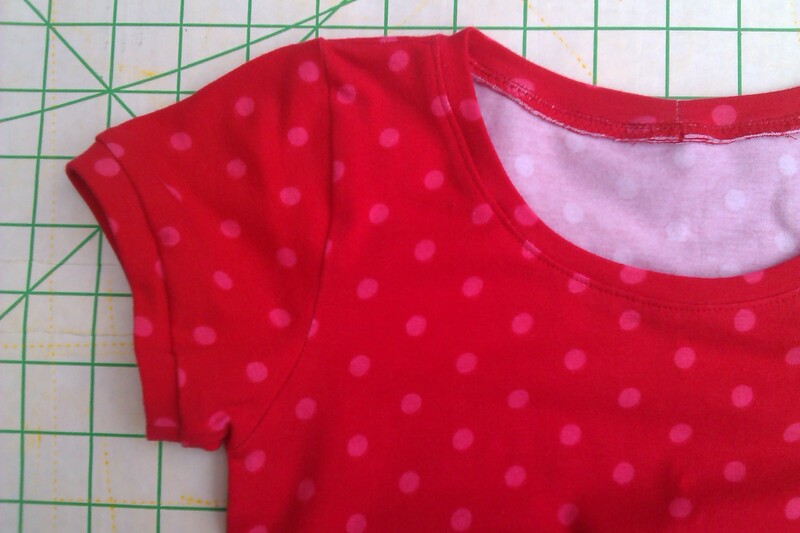 The red and pink polka dot fabric was from myfabrics.com. 95% cotton 5% spandex £9.00 per metre. It’s the same quality that I made this Renfrew top from and I bought it at the same time. I haven’t been impressed with the way the navy fabric has washed. It only took a few washes before it started to look faded. 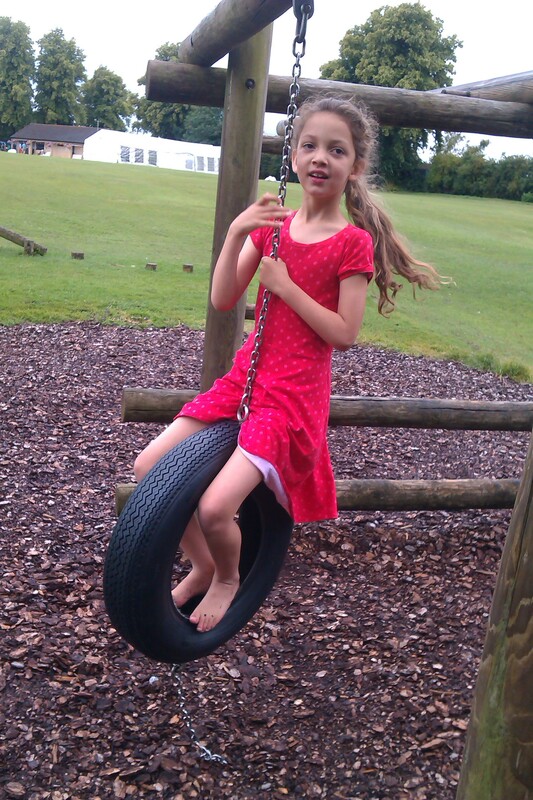 But then I have been washing it at 40 rather than the recommended 30 so I’ll take a bit more care with this dress. It does have a bit of a strawberry look about it!